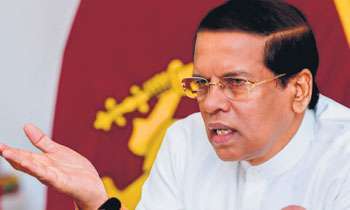 President Maithripala Sirisena yesterday directed Inspector General of Police Pujitha Jayasundara to conduct an investigation to find out as to who was behind the story published in two Sinhala newspapers today which said that the government was concerned about a threat to national security. The two news items published in those newspapers on Friday purportedly based on a discussion at the National Security Council and the President's Media Unit said that the Security Council did not discuss any issue pertaining to any threat to national security or to the lives of the general public. The President's Media Unit further said the news item was false and it had been fabricated by some individual or some organization. The President had instructed the IGP to investigate the matter, it said. The way to go Mr President. You need to be tougher and don't worry too much about your next term. Mr. Prez without smoke no fire, after you took over as President and made Ranil as the Prime Minister, the country is facing lot of problems. Correct yourselves.... otherwise, both main parties will collapse soon. Very poor Governance, Mr. President you must agree and if you guys cannot run the Govt. please quit. You both (RW and you) are not at all bothered about the burning problems SriLanka is facing, half of the population will soon stave and die because of the high cost of living, in-bearable taxes are imposed in SriLanka and hopefully before the term you guys will have to vacate the seats. Haha, can't catch a thief, talk about cyber crimes. I am Only one term president.catch all biggest thieves and bring back to country their stolen billions.this year is srilanka's 30th independence.i apointed country's biggest kudu boss a cabinet minister and my adviser.all these going to be fake news???. who is this biggest kudu boss? One court by customes 270kg kudu.other one frm negombo.are you from colombo or from thick jungle?? ?.